Our top 5 bespoke gift and stationery items for bridal parties — Paper Trails Design Co.
We all know that Pinterest is one of the first stops to help inspire the vision of your wedding. With endless ideas and themes to choose from, it can be exciting and yet, sooverwhelming. Not to mention the overload of do-it-yourself ideas out there—although many of them are great ideas in theory, these projects can take up a lot of time many people don’t have. Over the past few years, I’ve worked with clients on some neat ideas that incorporate calligraphy and lettering to personalize and enrich their events. From décor and stationery to personalized gifts, there are so many ways to add beautiful personalized details. I thought it would be helpful to share some of our top requests and interesting projects that we’ve worked on. There are so many varied ideas, so we’re narrowing things down and focusing on personalized stationery and gifts for your bridal party. We love this personalized bridal proposal idea. These cards feature a watercolour design and the names of your bridal party members handwritten in gold ink. We can also add their names to the envelopes, too. We've heard numerous times- people LOVE getting personalized calligraphy card. They’re so beautiful that you can easily place this on top of a gift as a 'gift tag' or simply add a gift certificate inside! These are easily available to order through the online shop or etsy. A lovely keepsake for your bridal party (and makes for gorgeous wedding day pics! ), these hangers can complement somany wedding styles. We offer a choice between two hanger colours as well as a variety of ink colours (Gold, Rose Gold, White and Black). They can also include personalized details such as ‘Bride’ or the date of your wedding. Available online or on the etsy shop. While most weddings show the tables where guests will be sitting, they don’t usually specify the actual places at the table. Some couples like to specify seating for their guests if it's a smaller wedding (ie at a restaurant) or for the head table at any wedding. Creating place cards is a great way to ensure everyone’s sitting as planned and another detail that makes your table decor gorgeous! 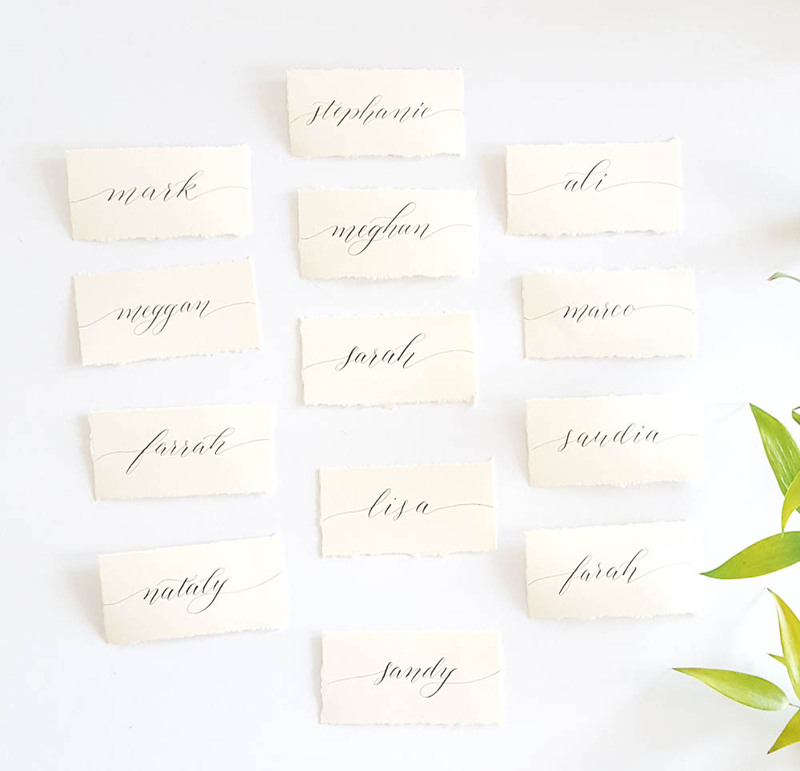 We’ve received a lot of feedback that people love to display their handwritten place cards at home, so this would work as a lovely keepsake as well. Card designs and colour options are extremely versatile and can be made to complement any style. This is a small sample of how varied they can be! 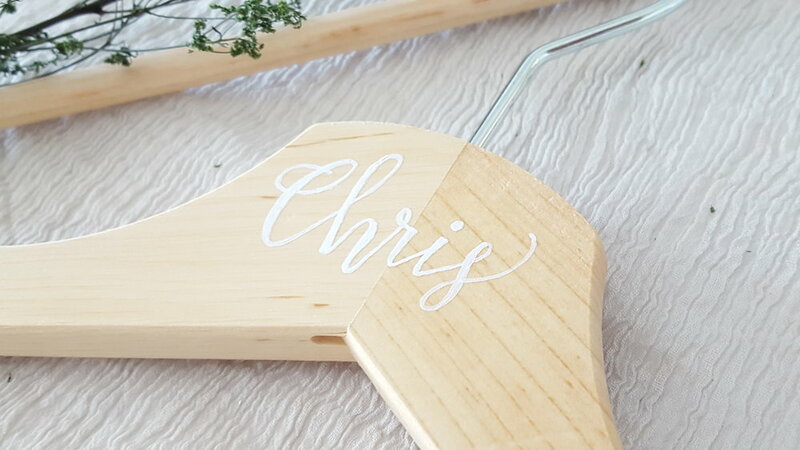 Adding a personalized element to a bridal party gift is a great way to thank your best people for their support. We’ve lettered on so many things! Some of our favourite ideas for customized gifts include tumblers, wallets, bookmarks and bags. Of course, you will want to include a little note of thanks to your bridal party for their support. We have made many personalized Thank You Cards for bridal parties, handwritten with names on the cards and envelopes. There you have it! You can personalize everything or simply stick to a couple customized options to express your gratitude and appreciation to your closest pals. If you would like to chat about how we can help customize stationery and gifts for your bridal party, please get in touch!